Last week we reported that we have a Cladophora bloom at our dive site. 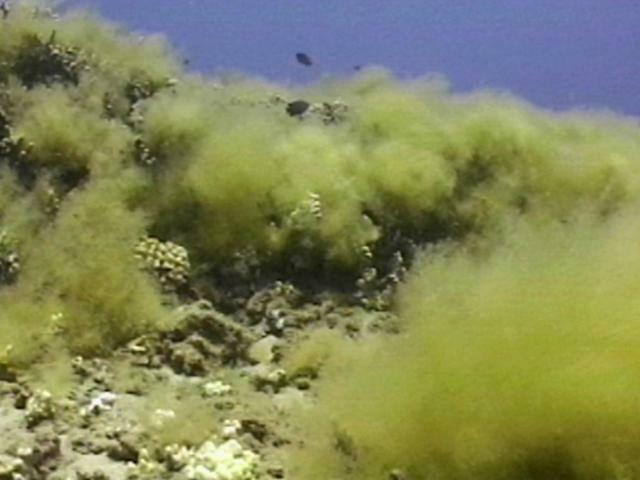 The green slime is growing from about the 20 foot range right past depths of 60 feet, the end of our range. This week, the full moon and low tides brought currents that were stronger than usual, especially in the mornings. This resulted in more spreading of the Cladophora. Also, some of the red Hypnea that usually collects on the beach was sucked out into deeper water. There it drifted on the surface, in the water column, or rolled around in underwater clumps that resembled tumbleweeds on the ocean floor. All the while, our reefs were greening up further as the Cladophora drifting from the north snagged on corals towards the southern edge of our dive site. This week, we sighted a large turtle scratching her plastron and armpits. When we saw her facial markings, we immediately recognized our old friend Raphael. We have known Raphael since 1992 and hadn't seen her since August '96. We checked for tags (we figured she was absent last year because she was nesting) but found none. Raphael's absence from Honokowai last summer thus remains unexplained. She looked very different from when we last met. The great news is that all the tumors she had in 1995 and were improving in '96 were now completely gone. She'd grown in both length and girth, and she had clearly missed no lunches. She had white rings around all her appendages! There was more, however. She had white rings around all her appendages! She looked strange, as though someone had taken a wide brush dipped in white and painted rings around her neck, flippers, and even her tail! Close inspection of the white revealed "craters" very different from her normal turtle skin. We have shared this information with the CTURTLE mailing list, but so far no one can tell us what we are looking at. Since then, we have found two other turtles with these white "rings". Another exciting resight this week is McTaggert (F 765), spotted on a morning dive. We've known this turtle since Summer 1992, although another diver, Rob Hawes, first photographed her in March of that year, making him the first person to take her picture. McTaggert acted like no time had passed since last we met. Like Tutu and Raphael, McTaggert acted like no time had passed since last we met. This strongly hints that green sea turtles have impressive long term memories. Honokowai does offer some wonderful news this summer. So far, we have completed 20 dives. We have identified 51 turtles, of which 24 are have been sighted in other years. Of those, thirteen or 55% have or have had tumors. This is down considerably from the 90% tumor rate we have reported as recently as last year. 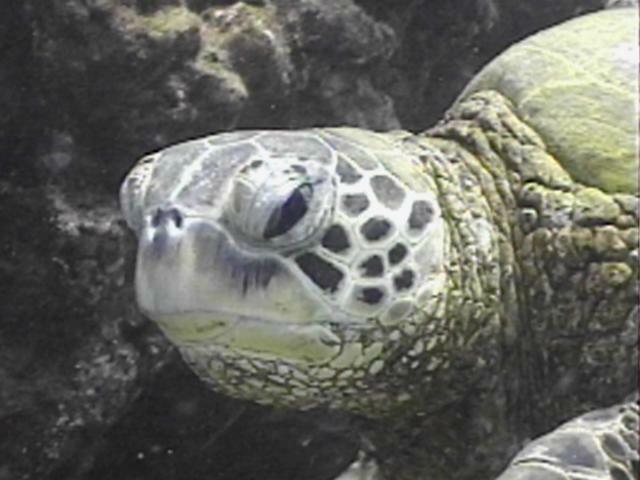 When you remove turtles sighted for the first time in 1996 and 97, however--assuming it takes at least two years for a turtle to develop the disease once they show up at Honokowai--we have 16 turtles sighted in 1995 or earlier. 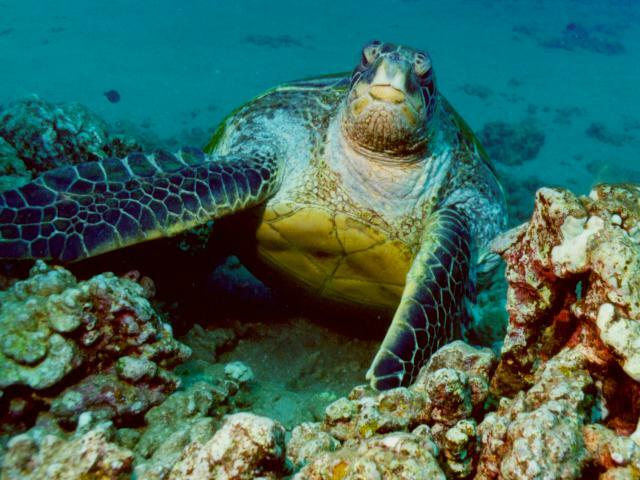 Of those 16 honu, 11 or 69% have or have had tumors (still down from our normal 90% rate) and of those 11, nine or just over 80% have improved, that is, shown regression. Of course, this is to be expected. The only turtles still around from the early times would either have stayed clear of the disease or improved. The rest--so many more--are assumed dead.